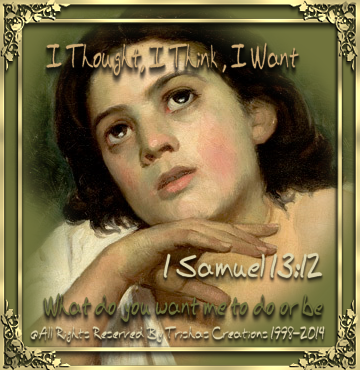 "I Thought, I Think , I Want 1 Samuel 13:12 "
Welcome to "I Thought, I Think, I Want"
When we read about Saul, and the ideas he had about things, we can wonder what was he actually listening. When Samuel the prophet had to correct Saul for not –– doing what he had instructed him to do, Saul replied, ‘I thought. Saul, then continued to express his idea of how he “thought” things should have been done. Look at, 1 Samuel 10:6-8 and compare it to 1 Samuel 13:8-14. We need to ask God, "What do you want me to do or be" and what you need to be obedient to what He tells us. If Jesus is not Lord of all, and He is not Our Lord at all. He may be our Savior, Our Lord and Master, Let God take His place in our lives which is "First place” in everything. Joyce Meyers Bible. You would be surprised, everyone would be surprised, if they would just take the time to spend in God's presence, pray and seek Him, that all their wants and needs will come to them. But, so many want to go after them themselves, when they want them they do not give God time to make sure they get what He wants them to have........this is why so many people end up in messes and they cannot see straight. If, people would just give God a chance to show them , He is in Control of the problem or the circumstances they will see God work. I have over the years, tries hard to do it my way, well I am here to tell you my way never pans out and if God isn't in it, then it isn't going to happen the way we want it to. Using the "Wisdom" God gave us is an example of how we should act and depend on Him! God, wants us to have what we want, but.... in His timing, in His way, in His abundance. So many have tries rushing the "I Thought, I Want, I Think" until they are so miserable that they cannot see straight and they cannot get out of the hole they caused themselves and climbed into. God knows what He's doing, believe me He does, and if people would just give Him a chance to show them, that He loves them and He cares about them, they would see just what a Generous Father God we have. So, many try to make it on their own thoughts, and wants......but have you ever realized, just what GOD WANTS? No, many don't they just go on their merry ole way and think "Oh I can do it myself, I'll get it faster" well sad to say they didn't get what they went after, because God wasn't in it, they never gave God the chance. If, we stop and wait and listen , we will see Our Thoughts, Prayers, Desires of our hearts, come to us, but if you want to be hasty and try to do it on your own, then all can fail. Give God the Chance to show you , He's in Control and He knows what's best and you don't!